Hi friends! Stephen here and Its my day to share a card creation on the Stamp AnnieThing blog. I am sharing a card that has been sitting in the back of my head for about 6 months now. 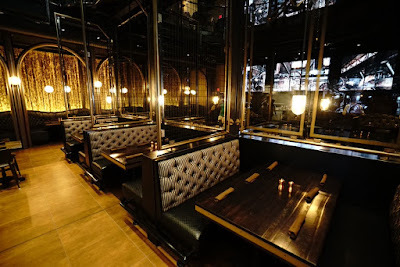 Back in November, I ate at a restaurant called Toothsome Chocolate Emporium...its a really cool steampunk styled restaurant with amazing food (AND desserts!!) at Universal City Walk in Orlando, Florida. Inside of Toothsome Emporium - my inspiration photo of my card creation. I immediately thought the Maggie - Steampunk stamp set would be perfect to create a card with a design inspired by the restaurant. I created a shaker card filled with gold coloured balls and crystals. I also used Nuvo Mousse to add accents of golds and bronze onto of the embossed black cardstock. To finish off the caed, I added some black and white striped paper. Lastly, I heat embossed the sentiment using a bronze embossing powder to tie everything together...and of course I added a few sequins because it wouldn't be a card of mine without sequin. I hope you like my card creation! whaou!!!! elle est tellement belle et originale, j'adore!